Our friend at the flower market who grows the calla lilies for our shop in Portland also has 40 chickens. Every year over the winter, as the pluvial Pacific Northwest endures its onslaught of alternating grey darkness and dark greyness, the birds more or less give up egg laying altogether. Stubborn about our eggs, we more or less give them up too, and the resulting drought of omelets, frittatas, aiolis, caesar salads, mayonnaises, pound cakes, and pisco sours is one of the greatest hardships of winter. Come spring, however, the chickens kick into gear and produce cartons upon cartons of bug-fed eggs with lovely brown-speckled shells and yolks the color of radioactive apricots. 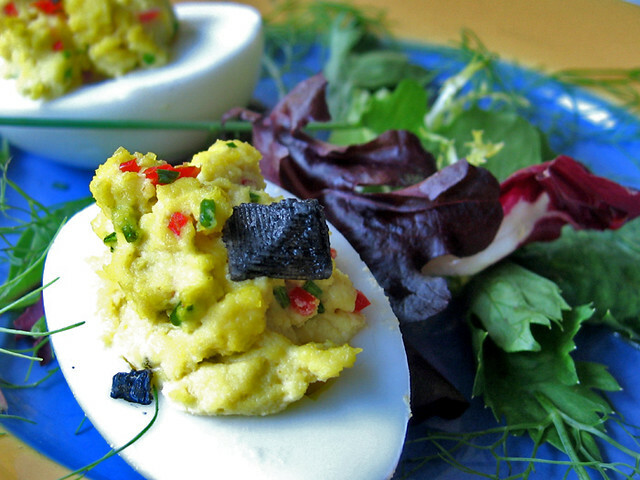 If you have good eggs, consider the following deviled eggs recipe. The chile in this recipe will give them a little kick, while the Black Diamond sea salt (a Cypriot flake salt infused with activated charcoal) provides jaunty contrast with the yolks as well as an incredibly satisfying, potato chip-like crunch of pungent salt. Put eggs in small pot. Cover with cold water. Add a handful of sel gris, cover and bring to a boil. Turn down to a simmer and cook the eggs for 2 minutes. Remove from heat and rest for 12 minutes. By “cooking” the eggs off the heat you insure that the protein in the yolk and white will set up gradually. The results will be creamy and pristine, without a trace of sulfur-green surrounding the yolks, a common problem when hard-cooked eggs are overcooked. Drain and cool the eggs under cold running water, and refrigerate. Cut the eggs in half lengthwise, dipping the knife into a bowl of water before every cut. Remove the yolks to a small mixing bowl. Add the mayonnaise, mustard, and chile and mix until fluffy. Fill the hollow of each egg half with the yolk mixture and sprinkle with black diamond salt. Serve within 30 minutes. Combine egg yolks, mustard, and lemon juice in a small bowl. Beat with a whisk and slowly drizzle in the oil, about 2 teaspoons at a time, waiting until each drizzle is incorporated before adding the next. Continue until all the oil is incorporated. Season with fleur de sel and ground pepper. Store in a tightly closed container in the refrigerator for up to 3 days.